Since its creation in 1994, Airstar has been a world leader in designing and producing inflatable technologies across various industries – from lighting to aerospace and architecture. From the very early days, Airstar has worked with major festivals as promoters increasingly recognised the demand not only for quality line-ups, but also for strong organisational and aesthetic elements. Recently, Airstar supplied its trademark lighting balloons to the Wine & Dine Festival, which brought world-class food, drinks and entertainment to Hong Kong’s Victoria Harbour skyline in late October. Aside from wine-pairing meals designed by master chefs and tasting classes by industry experts, there were well over 410 booths featuring everything from single malts to craft beer to keep its patrons’ palates refreshed. Insights spoke with Romain Jean de dieu, General Manager of Airstar Hong Kong, about Airstar’s experience on the Hong Kong Wine & Dine Festival and its plans for 2017. Festival Insights: How long have Airstar and the Hong Kong Wine & Dine Festival worked together, and how did the partnership come about? Romain Jean de dieu: Airstar Hong Kong has been working with the Hong Kong Tourism Board since 2009, speaking exclusively about the Wine & Dine Festival. We initially started by supplying 30 balloons and we have just wrapped up the latest edition with 50. In 2009 we met a few government officials, who were really enthusiastic about the products and the atmosphere they created. They decided to partner with us after a few demos, and here we are now. FI: This year the festival boasted more than 400 booths across five zones, offering samples of food and drink from 26 countries and regions. What did Airstar provide to the festival, and were there any unique challenges endemic to catering for such an expansive and varied event? RJ: Yes, it is always an interesting challenge to set up that many units across a large scale event. Typical challenges are related to weather, location, and the time provided by the customer to set up. This year all 50 units were set up in one of our shortest times ever recorded. Due to an approaching typhoon, we reinforced our technical team with freelancers so that everything was ready on time. FI: Airstar’s portfolio includes an eclectic array of festivals and events. Did you have to make special considerations in supplying a food & drink festival, as opposed to a music festival? RJ: The client usually asks for the same type of products, mainly from our Crystal range. 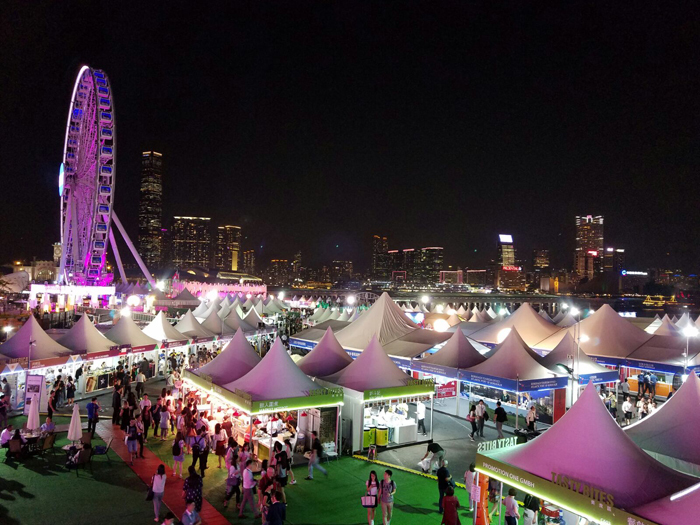 The HK Wine & Dine Festival is an event financed and managed by the government, therefore the budget is more flexible and allows for a larger amount of products to be deployed compared with music festivals, for example, where the budget can be more tight. The Hong Kong government is mindful about everyone’s safety, and therefore there is a requirement for a larger amount of balloons to light up the site. It usually takes a month of back and forth between the organisers and Airstar to get the final budget approved. Since it’s our biggest event, and one that occurs year-on-year, we maintain a great partnership with the Hong Kong Tourism Board. 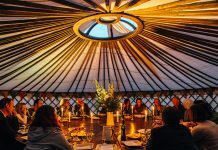 FI: Although the event had a footfall of approximately 145,000 and a highly inclusive ticket price, it also invited Michelin-starred chefs and featured a range of opulent dining experiences. Did Airstar have lengthy conversations with the organisers on how to fit into the festival’s décor and appeal to its demographics? And how did it achieve this? 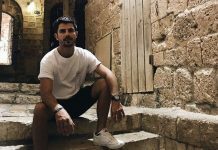 RJ: Every year they come back with similar ideas, accumulated from all the past years of negotiations and lighting simulations. Now everyone really knows what, when, and where to do everything. The design of the site has remained pretty much the same; we don’t have much room for more products or original ideas, unless the organiser wants to make a part of the decor a new attraction. We come every year with a basic package of Crystal balloons and new products, but it’s a bit difficult to get new things approved and jump into the unknown. FI: Tell us about some of the other festivals you worked with in 2016. Did any of them test your knowledge and expertise more than the others? RJ: Airstar lighting balloons have been used all around the world on major art and music festivals, including Glastonbury, Lollapalooza and Burning Man. Airstar is also very active in the French festival scene, featured on events such as Solidays and Musilac, where we recently introduced our brand new umbrella shaped Sunshade envelope. Airstar’s know-how and products are also displayed all around the world on major lights festivals: The ‘Fête des Lumières’ in Lyon, the Bahrain Light Festival, Moscow’s Circle of Light, and many more. Most recently, in October 2016, Airstar took part in the brand new Meadows Music and Arts Festival in New York, deploying 20 customised Crystal lighting balloons which displayed the festival logo as well as the ‘Emergency Exit’ and ‘Medical Booth’ signs. Our main challenge is usually to adapt to the short set-up timing as well as potentially extreme weather conditions. Speaking of timing, Glastonbury is a good example: the Airstar team managed to reduce the set-up time of the lighting balloons in 2015 by fixing them on the top of scaffolding tube rather than fitting them on the top of the gates as in previous editions. FI: Can you divulge any of Airstar’s plans for 2017 and how you’ll be moving forward? RJ: At the end of 2016 we launched the Crystal Dynamic White – a white LED lighting balloon which is dimmable, includes a colour corrector (from cold and warm white through to ‘daylight’ white) and is DMX controlled with a lumen flux of 50,000 lumens. Airstar will launch this new product on the festival market in 2017. Very resistant, easy to set up and with a low power consumption, we believe it will perfectly fit within the context of a festival. At the beginning of 2017, another LED product will complete our Crystal range: an all-in-one white and RGB lighting balloon.